Introduction - Human Factors Research. 1. Information System. 2. Supplemental Questions. 3. Research Methods. 4. Evaluation Procedures. 5. Applications. References. Author Index. Subject Index. In order to succeed, human factors research must blend the subjective and objective aspects of the client's situation, applying both argument and evidence. How to accomplish this complex and very necessary goal is the subject of this book in which information systems, research methods, and evaluation procedures have been formulated as elements in an application strategy that makes possible the blending of research and design. 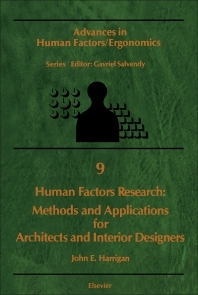 Three main themes are maintained throughout the book: the concern to ensure that designers know how to conduct human factors research in an effective and efficient manner; the emphasis on obtaining the benefits possible when designer and client work in collaboration; and the possibility that what is presented should stimulate thoughtful ideas about new computer applications or database features. Human factors research is fundamentally a problem of information development. Using the standardized information system presented in the book, the promise found in human factors research can readily be realized as the research questions and methods given provide a strategy and means for situational analysis. A necessary adjunct to human factors research is a means for assessing findings and translating them into specific design objectives, criteria, and specifications. The evaluation procedures described are directed toward these very complex requirements and provide a means for database development. The final chapter of the book contains research strategies, guidelines for establishing scopes of work, schedules, and budgets, and suggestions for proposals for those situations in which standard fees do not provide sufficient funds for human factors research. The book is written primarily for architects, interior designers, and students of environmental design. Many others will also find it of value: those who employ professional design services, executives who formulate policy for facility development and capital investment, administrators of housing, community service, educational, and recreational programs, developers concerned with community acceptability and marketability, managers of office buildings, industrial plants, and service and retail stores, and those who plan to design their own environments - all need a systematic approach to assure full benefits from their efforts and capital investments.